Vespa, the iconic Italian scooter created in 1946 by Enrico Piaggio and aeronautical engineer Corradino D’Ascanio saw interest (and sales) explode in 1953 when Audrey Hepburn and Gregory Peck rode one around the streets of Rome in ‘Roman Holiday’. The brand has seen renewed interest in the last few years as a lifestyle statement and affordable alternative to the automobile. I can easily count a dozen Vespas on any given morning on my walk to work. 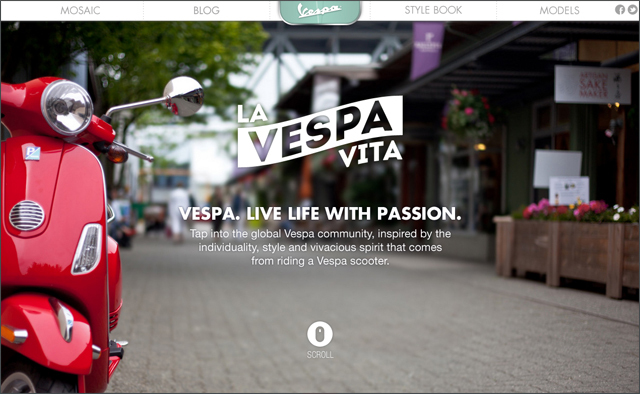 Vespa USA has highlighted the style aspect of the scooter brand by creating ‘La Vespa Vita‘, a community site consisting of user generated content. The site features mosaic of photos pulled in from Instagram and Flickr. Photographers can have their Vespa images included by adding the hashtag #VESPAVITA to the description, and writers can also contribute a blog post in categories like Vespa style, history, fashion or lifestyle. Fashionistas can have their images added to the Vespa Look Book by posting images with the hashtag #VESPASTYLE. A quick look on Statigram reveals dozens of images already using the #VESPAVITA and #VESPASTYLE hashtags.